High school is such an exciting time of life for our kids. While my daughter is busy having fun I want to document the whole experience for her. Creating a memory book of her time in high school is the perfect graduation gift. I have some tips for how to scrapbook your child's high school years so you don't get overwhelmed with the project! 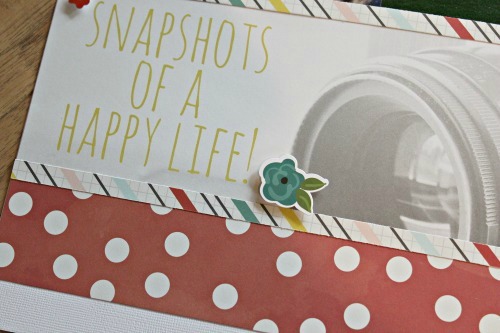 It is back to school time and that means getting organized with our scrapbooking goals! If you want to give your child a scrapbook of their high school years then start now! It is okay if they are already a sophomore or even a junior…just get started as soon as you decide to do it. The key is to NOT put it off until the last minute. It is a big project and senior year is a really busy time. I see people wait until March of senior year and then try to put together a scrapbook that encompasses 4 years!! That is a huge undertaking and can cause a lot of stress. Get started now!! 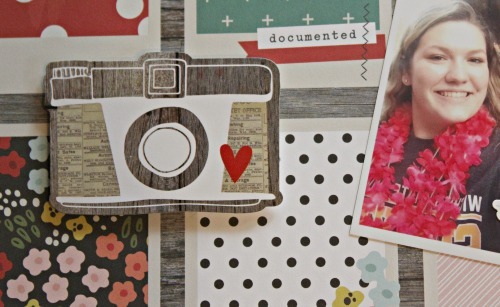 Staying current on photos is an easy way to save time on your scrapbook project. It is time-consuming to look through hundreds of images that span a few years. to stay on top of my pictures. This printer is the world's smallest all-in-one printer. I love how affordable this printer is and that it fits (and looks adorable) virtually anywhere! A lot of my daughter's pictures are on her phone. 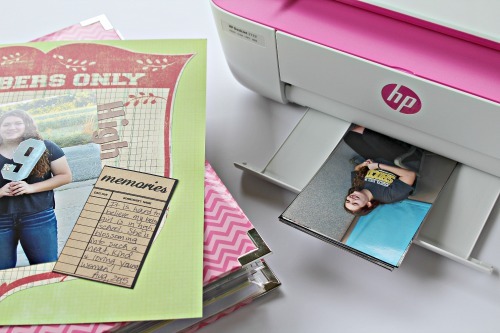 I am able to connect her smartphone directly to the printer and grab those memories for her scrapbook without any hassle at all. 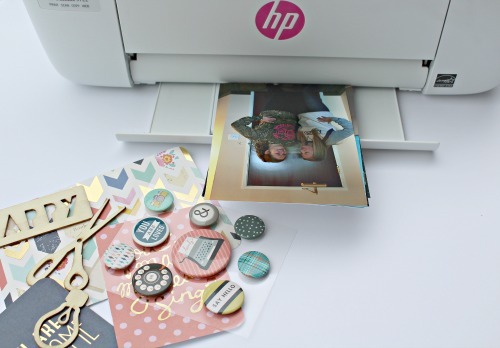 Hover over this image to shop for your own one-of-a-kind printer to use for your scrapbook! It won't be long until she is off at college and she will be able to pick a printer in one of the new colors (Sporty Purple, Poppy Pink, Dragonfly Blue) that are only available at Walmart to take along with her! The wireless capabilities are perfect for busy college students. As you are printing your pictures off be sure to keep them in order and organized so you don't have to take time to sort them later. I want this scrapbook to cover my child's high school years, but also be a reasonable size!! Be realistic about how many pages you have time to complete. Think about the highlights of high school and cover those activities and events. I like to throw in a few pages of everyday memories as I go and then do some spreads for those big events like sports, dances and Prom. It isn't feasible to do every single thing during those four years if I want to have this book done and ready to present to her at graduation! So I try to scrapbook the highlights of each year during high school. Think about what your child will want to think back and remember. I want my kids to LOVE their scrapbooks. Bringing their personality onto the pages is important to me. I think about their favorite things, colors, etc and try to incorporate those into the layouts. 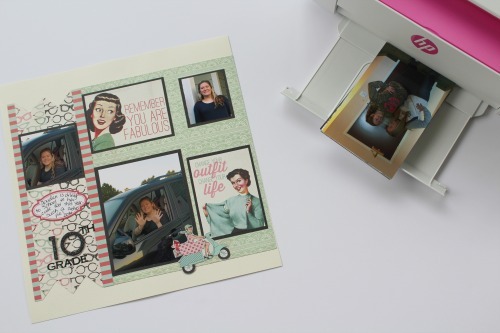 Bringing your child's personality into the scrapbook will make it even more special to them. Finding embellishments to fit their nature is an easy way to make the book something they will cherish. It can be hard to find time for your hobbies. The best way to get a big project done is a little bit at a time. 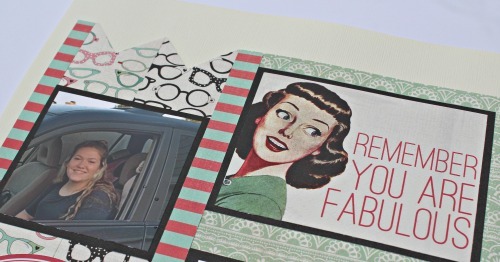 Set aside a few hours a week to work on the scrapbook and you will be surprised how far you will get. One of the best ways to figure out how to scrapbook your child's high school years is to work consistently on this project. 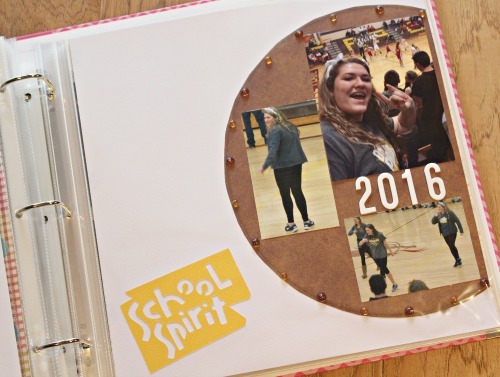 How is Your Child's High School Scrapbook Coming? So have you started to scrapbook your child's high school years yet? What do you have planned and how long till you need it done? I would love to see some of your pages!! You can join my Sweet Scrapbooking Facebook Group and share your creativity with other crafters! 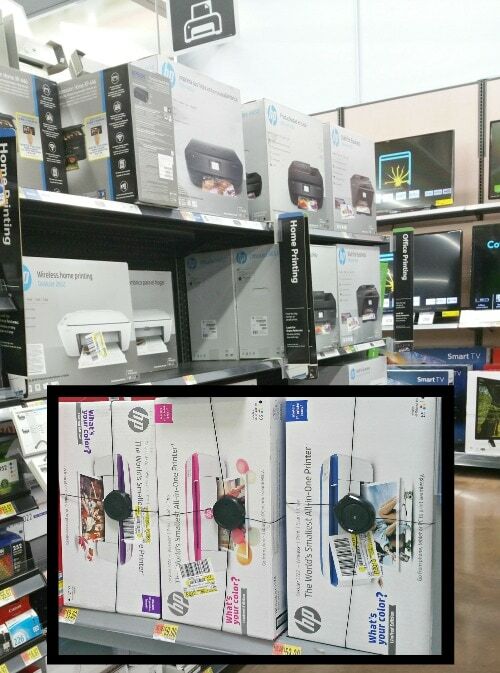 Be sure to check out the in-store demos of the HP Deskjet 3722 All-in-One Printer/Copier/Scanner that are taking place at Walmart stores right now! My mom made a scrapbook/photo album for me when I graduated from high school. I still have it and cherish it over 25 years later. It took her quite some time and I totally agree that you should really start ASAP!